There are a few generally agreed-upon qualifications someone must have to be “Bartender of the Year” -- that person has to be good with people, constantly innovating, passionate about what they do, and incredibly knowledgeable about spirits. The bartender should be thoughtful, conceptual, creative, and most of all, they’d better make craveable cocktails that taste really damn good. It also doesn’t hurt if they’ve had to overcome some adversity along the way, but still managed to garner a loyal following of patrons who follow them anywhere they go. 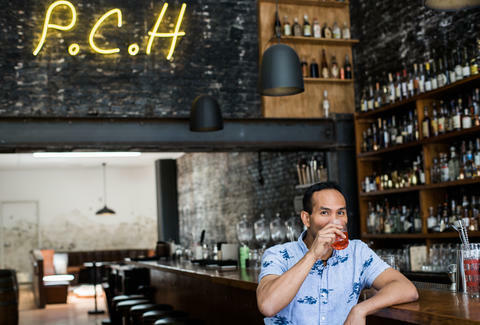 No one better embodies those qualities than Kevin Diedrich, general manager and partner at the recently opened Pacific Cocktail Haven in Union Square. Which is why it only make sense that he take this year’s honors. 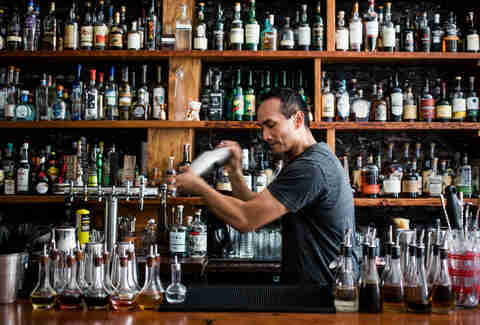 Even if you’ve been lucky enough to drink Kevin Diedrich’s creative cocktails at Burritt Room + Tavern, Jasper’s Corner Tap & Kitchen, the short-lived BDK, or his current home, Pacific Cocktail Haven, and converse with the man behind the bar, you probably don’t know that he started his career working in IT in Washington, D.C. But he hated the office setting. "Every day was spent staring at a computer screen for hours on end trying to troubleshoot software and hardware. There was no action, no energy," he said. Lucky for all of us, Kevin's best friend and roommate at that time was a DJ. And his girlfriend was a bartender. Which means Kevin spent a lot of time going out at night. It didn’t take him long to realize that the nightlife scene was a lot more fulfilling than troubleshooting why someone put their credit card into the floppy disc drive. So Kevin quit his job and paid $500 to attend a local bartending school. He had no idea it was going to be a career but, at the very least, it would be an escape from a job he no longer liked. “I came out of there and was like, ‘I’m going to be a bartender,’ but no one would hire me because I had zero experience,” he said. Kevin was turned down for job after job. At one point, he thought maybe he had a shot to get a job at The Cheesecake Factory. He begged them for a chance, but they told him they were high-paced, high-volume, and just didn’t think he’d have the skills to handle the job. Eventually, Kevin coaxed his girlfriend’s manager to let him work behind the bar one night and once the manager saw his skills, he told Kevin to go ahead and tell any future employers he’d been working there for five or six years. “So I pretty much lied on my resume and that’s how I got my first bartending job at the Ritz-Carlton.” That little lie paid off big-time. Working day shifts at the Ritz taught Kevin refinement and hospitality skills, while the fast-paced cocktail slinging was a skill he honed on the weekends at nightclubs. A few years later, the Ritz became more interested in the burgeoning craft cocktail scene. Kevin was onboard, but didn’t know anything about it, so he did the only thing he knew to do. He bought Sauce Guide to Cocktails by Simon Difford and learned as much as he could. Not long after his move to San Francisco, Kevin interviewed with Todd Smith at the newly opened Bourbon & Branch. “I went in and sat at the bar for one night and he made me cocktails and they were awesome. I told him this was exactly what I wanted to do.” He got the job. After Bourbon & Branch, Kevin continued to hone his skills at Cask and Michael Mina’s Clock Bar before returning to DC to open Bourbon Steak (and, more importantly: to finally convince the woman who is now his wife to go out with him). Kevin came back to SF in 2010 to help concept and build out Burritt Room, a hotel bar in the (then-) Crescent Hotel. “I have a huge soft spot for hotels and hotels bars,” Kevin says. “So it’s always been a dream of mine to do a classic hotel bar.” Unfortunately for Kevin, the management groups at the hotel bars where he worked kept changing -- three times in total. Then, when the Crescent was purchased by Charlie Palmer, he moved to Jasper’s Corner Tap in the Serrano Hotel. After the hotel that owned Jasper’s also switched management companies, Kevin was scooped up by Kimpton. A few years later, he thought he’d finally found a home at Union Square’s BDK Restaurant located in the Hotel Monaco, but after just a few months, that hotel and restaurant also underwent a management change and, once again, Kevin was on the outs. Even in face of such disappointment though, Kevin said he tried to stay positive and passionate about his craft. But he couldn’t help but start to wonder if maybe San Francisco just wasn’t for him. “After we lost BDK, I was helping friends around the city and trying to figure out what my next step was.” He and his wife were about two months out from moving to Hawaii when he got a call from Sidecar Hospitality (Press Club, Schroeder’s) co-founder Andy Chun about a little bar in Union Square called Cantina, where Kevin and his dog Kona liked to hang out. Andy had recently bought Cantina and asked if Kevin would be interested in managing it. Kevin was definitely interested, but added, “I don’t want to manage a bar anymore; my next step is owning something.” So he, Andy, and his partner Jan Wiginton sketched out a vision for Cantina as co-owners. But there wasn’t a lot of money to do anything, which is how Kevin came up with the idea to run Cantina as a pop-up for a few months. The hard work paid off; when Pacific Cocktail Haven finally opened under its new name, it did so with zero debt and a very loyal clientele who’d watched the entire transformation. The neighborhood cocktail bar was instantly popular with locals and tourists alike. Kevin is also doing great things at the newly renovated and reopened Elite Café on Fillmore St in Lower Pac Heights. As part of his partnership with Sidecar Hospitality, Kevin created the bar program for the New Orleans-style restaurant. Thanks to this bar program, the Elite Café is no longer just a place to go for brunch or when you have a hankering for Meetinghouse Biscuits; it’s now a destination for an after-work or late-night cocktail. You’ll find French 75s made with Cognac, a Frozen Hurricane, and, of course, the classic Sazerac. Kevin’s constantly coming up with new ideas for cocktails, but he is currently obsessed with brandy and sake. He fell in love with Calvados, Cognac, and brandy after visiting France, and got excited about sake after tasting more than 300 at an event last year. 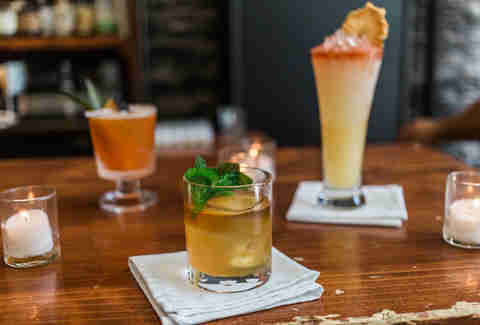 Those creative cocktails have earned Kevin quite a following, and are the reason he was named one of San Francisco Chronicle’s “Bar Stars” in 2011. The people of San Francisco love his drinks, and Kevin loves to make them. What’s not to love? And we’re very lucky that Kevin Diedrich has finally found a bar he can call his own. Pacific Cocktail Haven is open from 5pm to close Monday through Saturday. It’s worth getting there on the early side, so you can say hi to Kevin’s adorable dog Kona. Daisy Barringer is an SF-based writer who loves a martini with a sidecar. Lucky for her, there are a couple of those on the PCH menu. Follow her on Twitter @daisy.